One of my goals for this year is to step up my side-hustle game. Since we’ve already paid off our debt, my only goal for this extra income is to increase our savings. If my side-hustle income continues at the current rate, I’ll have an extra $6,000 by year-end. I started off the year with a blogging bang. My traffic is up to nearly 60,000 page views per month and my blogging income is up as well. *Sucuri was $200 for the year which all hit in January. Fiverr and Facebook ads were one time fees. All other expenses are monthly. If you’re interested in making money blogging, read this section. Otherwise, skip to the later sections. Blogging isn’t my only side-hustle this year! I truly believe in the Pareto principle. That is 80% of the outcomes come from 20% of the inputs. For that reason, I’m going to give the “Lite” and “Lux” version of how I make money blogging in the case that someone reading this wants to try it out. You obviously need a blog to make money blogging. I created my blog and purchased my domain name with Bluehost. 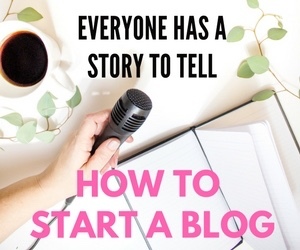 Check out my How to Start A Blog Guide if you’re thinking about starting your own site. In order to make money blogging, you need to sign up to promote products. There are companies out there that have relationships with thousands of merchants and if you sign up for them (it’s free to signup), you can search and see what merchants you can promote. For example, one of the companies I promote is Personal Capital and I signed up to promote it through FlexOffers. 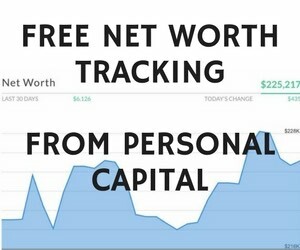 I’ve been a Personal Capital user for years (my husband and I use their net worth tool to track our savings) so it made sense for me to promote that product. As you can see from my income, I make the most money from FlexOffers, MaxBounty, and ShareASale. I recommend signing up for them and seeing if any products you already use are offered. (Just a tip on FlexOffers – sign up for a “publisher” account. I was confused by that when I first signed up). I also make money through Ebates. I don’t buy anything online without checking to see if Ebates offers cash back first. It’s pretty natural that I would make good money promoting Ebates since it’s free to use and saves people money. If you’re interested in promoting Ebates, sign up for Ebates here, and get $75 for your first three referrals. Pinterest was my #1 traffic and income driver this month. It’s really hard to make money if no one knows about your site. I use the automatic pin-scheduler Tailwind, which is fairly cheap for the dollar return I’m getting each month. Tailwind also enables me to blog and have a full-time job since pinning 100 images a day would take me forever. You can sign up for the Tailwind 30-day free trial if you want to test it out on your site. I also wrote this tutorial on How to Setup Tailwind if you need help setting it up. When I wanted to get serious about making money blogging, I started to sign up for paid blogging tools. The biggest ROI I’ve received is from The Making Sense of Affiliate Marketing Course, which I took late last summer. The course is great and the bonus is the private Facebook group that you get access to once you sign up. In the group, you can ask questions, share each other’s content (I get a big bump in traffic from Facebook group shares), and just generally help each other out. I recommend signing up for the course if you want to spend money to make money. 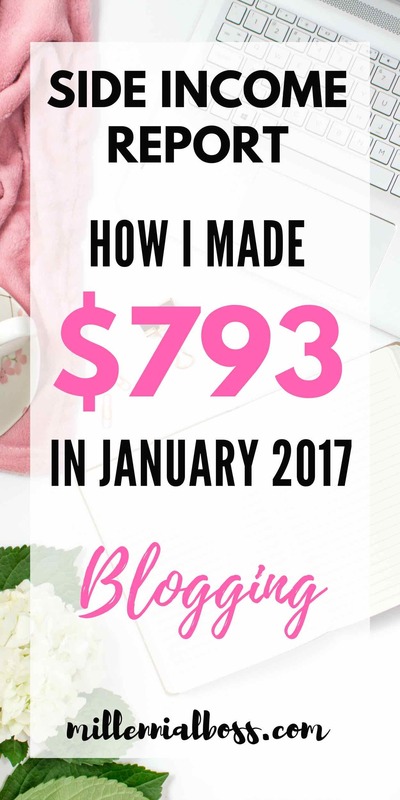 I make more money than I spend on the blog now so I’m happy with my approach. I actually spent more money than I made for a few months so don’t be discouraged if you’re not there yet. My second recommendation for the Lux level of making money blogging is signing up for Sucuri which is a website security and malware removal service. My site was hacked two weeks ago and another blogger (from the Facebook group I just mentioned) recommended Sucuri. The price was hefty, $200 for the year, but it was still 1/3 of the price of my other options. $200 was a huge hit but I would make the same decision again and again. I was delighted with Sucuri’s service. Delight seems like a silly word to use but I was so stressed out when my website was hacked and Sucuri truly made my day. My site was back up and fixed within hours. If you are already making money on your blog, I recommend signing up for Sucuri. If you’re not making money on your blog, perhaps back-up your site using a free plug-in and sign up for Sucuri when you have the cash to do it. (Although, I’m very risk tolerant. I probably shouldn’t have waited for my site to crash to sign up so maybe you should be proactive). As you can imagine, there is a super lux version of making money blogging too. I’m not making enough money on my blog to spend any more than I’m currently spending. Maybe I’ll get to this section in future months. I did play around with some Facebook ads this month to see what I could get for return on those. So far, my Pinterest game is better than my Facebook game but I expect to improve my Facebook game this next month. If you want to see more blogging tools that I use, check out my post 15+ Tools to Monetize Your Site. Side hustle #2 is that I’m a landlord. 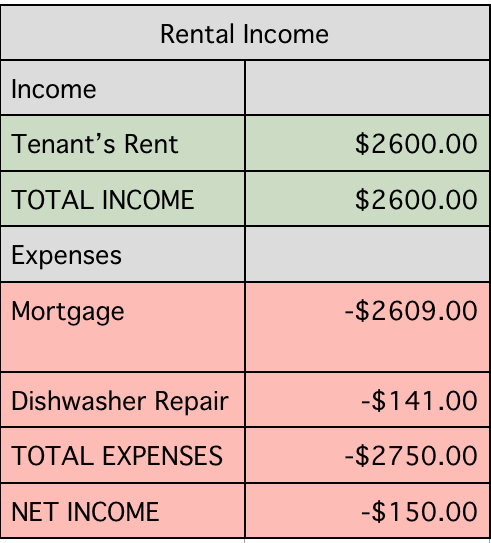 My husband and I accidentally became landlords when we could not sell our home this past summer. We ended up renting it out and it’s been fairly painless so far (despite the fact that we’re managing it out of state). We don’t use property managers because it would eat into the budget too much and we’re not quite breaking even on the property. As you can see below, we had a dishwasher incident this month. (The tenant clogged it with food and we had to pay someone to come clean out the filter). Most months though we don’t have any expenses. We’re interested in acquiring a more profitable rental sometime this year. We may even sell this property once the lease is up. We’re still figuring that out. I have two additional side hustles up my sleeve for this year. First, I’m launching a coaching service for anyone interested in either blog coaching or money coaching. I’ve reached a certain level of success on this site now and I can now help others repeat it. I’ve paid off $89,000 of debt and want to help people alleviate the burden of debt. Check out my coaching page for a list of my services and more information. For the second new side-hustle, I’m going to start selling physical products online through Amazon FBA and Etsy. I was motivated by a new blog friend that I connected with this week, Sharon at Digital Nomad Quest. 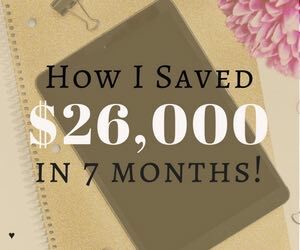 She’s currently making a good chunk of change per month on Etsy selling digital products. I also had a conversation with another set of friends that know people who sell private label products on Amazon. I’m going to try it out for a few months and see what happens. In fact, I’ve already made an order to buy a product! Expect more in next month’s side income report. If you want to follow along on my side-hustle progress, follow me on Facebook! Do you have any side-hustles going on right now? Tell us about them below! Earning nearly $800 on the side is pretty impressive. Saving up that much over a few years could really wind up paying off in the long run if you can keep it up. Good luck in the future. Thanks! Working hard and I hope to increase that amount next month! Congrats on this money you’ve made. I love reading about these income report, everyone seems to have a variant on how to make money with a blog. On my side, I’ve tried to sell stuff online but I can’t really compete with the price that china is able to make. Thanks for the encouragement on sharing my numbers and for stopping by! I guess I could private label and sell them. I should try it :). Great post on some great ways to earn some income on the side. I especially enjoyed the part on how you’re developing income for this blog as I am currently looking at ways to do the same on my site. It’s a big wide world out there and easily daunting. This provides some great tips and lessons learned. Thanks for sharing and being so open! You’re welcome! At first it felt weird to share the numbers but I know that details and numbers help me so I want to share them with others. Love these type of posts! Awesome to see that blog income. I’m hoping one day to get that blog income growing as well. Do you know if a lot of that affiliate income comes from organic searches and people finding a review you did? 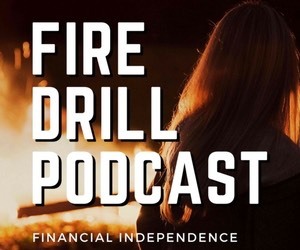 Financial Panther recently posted…Do You Use Work As An Excuse Not To Reach Financial Independence? The review of my engagement ring does well on Google and I have made money on that post. That’s awesome! I just broke $200 on my blog so I’m ecstatic. Can’t wait to reach $700 and then $1k!!! I’m excited about your service and product! Good luck! Seriously, I love your blog. I’ve picked up so many blogging tips from you! You’re going to crush it next month, I know it! Did you find the Facebook ads were of any value? I just started them last weekend and so far, I’m not seeing a high return. I was just playing around though and didn’t necessarily advertise posts that I thought would have high conversions. I wanted to play around with a few trial posts to see what happened. I’ve heard good things though from a blog friend who uses them regularly. It is really impressive! I hope someday I an also earn that kind of amount. I think I need to learn more. Congratulations by the way! You must be a full-time blogger, right? Nope! I have a full-time job. You have really kicked some a$$ to get your pagevies up to 60,000/month. Great job! Congrats on the page view growth! That’s awesome! I find Pinterest so confusing – it’s starting to generate more traffic to my site, but not a lot. I am getting more followers, though. Thanks for sharing Tailwind! I’ve never heard of it and will probably sign up using your affiliate link! Another sale there. Awesome progress. No problem! Yeah, Tailwind is great! Thanks for using the link. I get a referral credit so a little bit off my next bill. I set up my Tailwind pins every weekend. Highly recommend doing a bunch at once so you don’t go crazy! Thanks for the honest breakdown of your income. 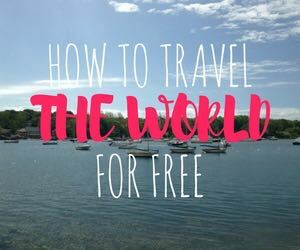 Right now most of the affiliate sales I make from Women Digital Nomads come from travel insurance commission, but I am currently looking into how I can diversify that! You can do it! I tried out a bunch of different products until I settled on a few. The key is to see what is working for other people in your niche. Good luck! Wow, this is an impressive post. I need to step up my game! 60k page views is incredible. Thanks! Seems crazy to me still. Congrats to you as well! I know it gets so hard to keep up when life gets busy.